Bristol zine creator Simon Moreton is one of the organisers of The Bristol Comic and Zine Fair on 3 October, bringing together writers, artists, and enthusiasts to celebrate independent and ‘DIY’ publishing. A zine is a self-published magazine or pamphlet, most commonly in an easy-to-make format such as A4 paper folded and stapled into a booklet. Often turning against the traditional ‘Hollywood superhero’ style of comic or the approaches of mainstream literature, the style and content of a zine is limited only by the author’s imagination. Once the zines have been designed, printed, and stapled, authors sell them at fairs such as the one in Bristol. Established in 2011 after Simon and his friends couldn’t find anywhere locally to sell their work, the fair is now in its fifth year and is hosting over 70 exhibitors. Unlike some fairs, The Bristol Comic and Zine Fair is open to all genres of zine and all kinds of creator, in a deliberate bid by the team to make the event as welcoming as possible, particularly to those who are new to the medium. True to this spirit of inclusivity, amongst this year’s exhibitors are two 9-year-old boys who are selling their zine ‘Bark’ to raise money to buy acres of rainforest for charity. But with today’s internet and social media, why bother creating a zine when you could just start a blog? Simon believes there is something valuable in creating a physical object that people can hold, take home and put on their bookshelves – an experience that is lost with digital media. However, he is very positive about the role of social media in networking amongst the zine community, and as a means of discovering new zine creators. The barriers to entry for creating zines are very low – all you need is a pen and paper. Or any other medium that takes your fancy. Simon advises budding zine creators to research zines online and talk to people who have already done it to get ideas. It may sound simple, but his final piece of advice is ‘just start.’ So what are you waiting for? 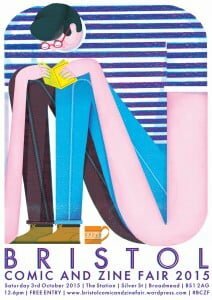 You can find out more about the Bristol Comic and Zine Fair at https://bristolcomicandzinefair.wordpress.com.